Pitch Madness is almost here! My website is currently undergoing a full makeover. If anything looks wonky, bear with me. 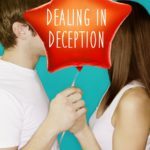 DEALING IN DECEPTION is out NOW!! Eeeeeeee! SALE ALERT! FLIRTING WITH FAME is on sale for a limited time! Grab it today for only $1.99 and catch up before DEALING IN DECEPTION launches in November! Find it anywhere you buy ebooks!